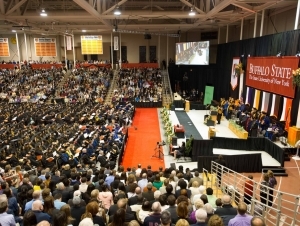 Buffalo State College will confer degrees on 1,979 undergraduate and 505 graduate students during its 143rd commencement celebration, Saturday, May 16, in the Sports Arena. The following graduates of the Class of 2015 will be honored with the SUNY Chancellor’s Award for Student Excellence in recognition of their academic and extracurricular achievements, leadership, and service: Diamond Briggs, Chelsea Davidson, Stephanie Kahn, Amy Marciniak, and James Martin. Martin will address the audiences at the morning and afternoon ceremonies as the recipient of the President’s Medal for Outstanding Undergraduate Student. Ted Mallwitz will deliver an address at the evening ceremony as the recipient of the President’s Medal for Outstanding Graduate Student. Rodneyse Bichotte, ’95, New York State Assemblywoman, 42nd District, will receive the Young Alumnus Achievement Award and deliver the commencement address at the morning ceremony, while James Brandys, ’71, ’73, member of the Buffalo State College Council, will receive the President’s Distinguished Service Award and deliver the commencement address at the afternoon ceremony. Kathleen C. Hochul, Lieutenant Governor of New York State, will deliver the commencement address at the evening ceremony. In addition, the College Council Medal will be presented to Howard A. Zemsky, president and CEO of Empire State Development Corporation and immediate past chair of the Buffalo State College Council. Distinguished Alumnus Awards will be granted to Roger Wood, ’85, president and CEO of Dana Holding Corporation, and Jacqueline V. LoRusso, ’62, ’64, businesswoman and philanthropist. Faculty and staff are encouraged to celebrate the accomplishments of our graduates and join them in this special day by marching in the academic procession or by serving as a volunteer. Marchers and volunteer ushers are still needed for the 10:00 a.m., 2:00 p.m., and 6:00 p.m. ceremonies. Online registration is open until May 8.